Drawing on the documentary films Bauhaus and Masterworks: Bauhaus, available on DVD from Illuminations, as well as on recent articles marking 100 years since the Bauhaus was established, Tom Allen reflects on the meaning and the legacy of one of the most iconic schools of Modernism. The Bauhaus lasted only 14 years, was in three different locations due to political pressures (Weimar, Dessau, above, and Berlin), had three different directors (Walter Gropius, Hannes Meyer, and Ludwig Mies van der Rohe) and was ultimately shut down by the Nazis for being an alleged Jewish-Bolshevik plot. Despite this brief but tumultuous history the Bauhaus has had a huge effect on how we think of art, design, architecture and their relation to the modern world. 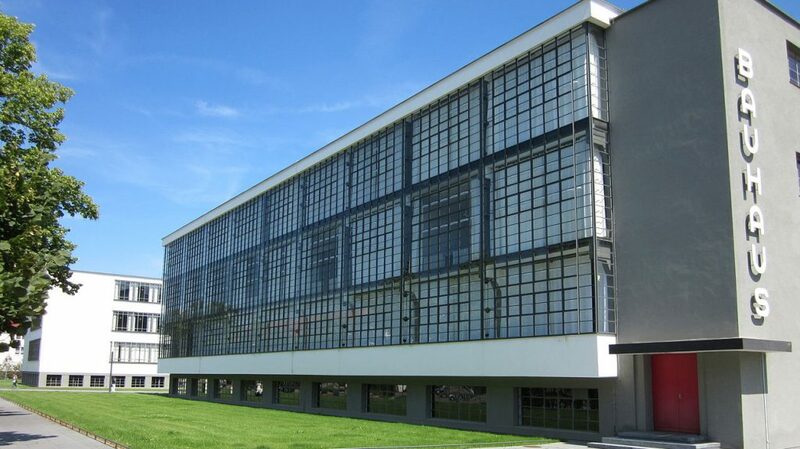 Indeed, the Bauhaus arguably offers the most successful example of all the schools of Modernism. Founded by German architect Walter Gropius in 1919 in Weimar, it had an ethos totally different from other art and technical schools. The Bauhaus drew on politics, theory, spirituality, and the most cutting edge of contemporary artists to try and remake the modern world. The idea of the Bauhaus came from Gropius’ experience during the First World War. The horrors of technology and modernity inspired him to think of how he could participate in something that, in his own words ‘would change the living conditions that I had been living in before’, in which utopian ideas would become a reality. These utopian ideas were greatly influenced by socialist thinking and revolutionary activity, such as the Bolshevik revolution and the failed German Communist revolution, two of the events that helped end the Great War. The artistic and social goal of the Bauhaus was to produce products for the masses that would in turn change the environment, and which would also mean changing man in to a better being. Its philosophy was built around short-circuiting the divisions between mass production and elite art; those between fine and applied arts; and the divisions within elite art such as painting and sculpture. All art was considered one by Gropius and the Bauhaus. At the centre of his thinking were design and aesthetic principles such as form follows function, meaning that nothing would be added that did not add to the function of the object. This was also accompanied by the notion to stay true to the materials used in creation, in which there was no need to hide any materials, or that no part of an object should prize aesthetic over form. 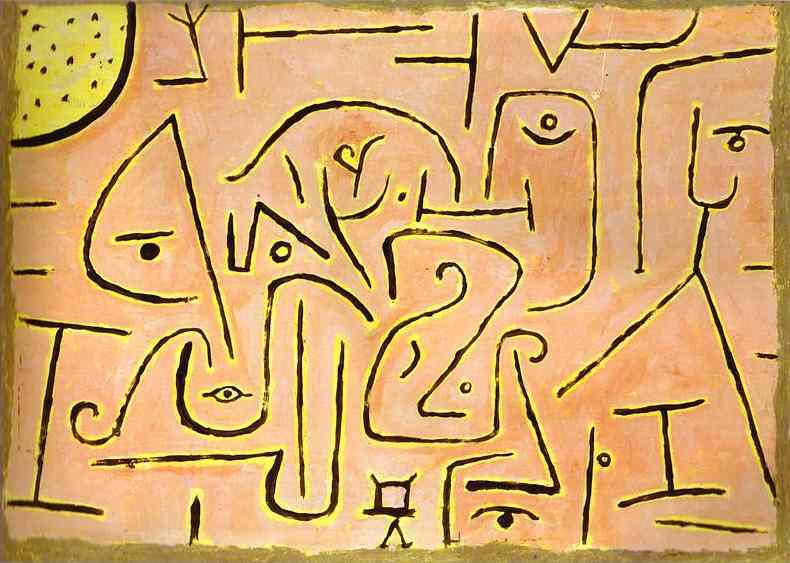 The school had some of the most cutting-edge artists of the day including Paul Klee, Wassily Kandinsky and Marcel Breuer, and it had a syllabus that reflected this. It was intended that students would not design on paper but would actively make things, and they would learn from skilled craft practitioners at the same time as they would be taught by artists for aesthetic inspiration. Art and colour theory played a major role too, with Johannes Itten’s The Art of Colour being a seminal text to come out of the Bauhaus. Itten, along with Klee and Kandinsky, drew up the foundation course that would be the cornerstone for the Bauhaus and help define its ethos and legacy. The foundation course focused on abstraction, geometry and colour theory and drew upon spiritual traditions such as Buddhism and Zooastrianism with students practicing breathing exercises and mediation. Bauhaus itself was somewhat out of time. As a school it based its ethos more around that of a craftsmen’s guild rather than a more contemporary framework of production or even the nineteenth century notion of The Artist. This also meant that the women of the Bauhaus were often put into forms traditionally understood as ‘women’s work’ such as textiles and pottery rather than metalwork. Part of the legacy of the Bauhaus is that its aesthetic has been so absorbed that it has just become accepted with many aspects of its teaching picked up by art and design schools. But there are specific traits of the Bauhaus that have been developed by subsequent artists and designers. In a recent Guardian article architects, designers, artists, and even novelists were asked what Bauhaus means to them. Almost all contributors claimed some inspiration from the Bauhaus but several added a caveat saying that that it was less to do with the Bauhaus aesthetic and more to do with the Bauhaus outlook and philosophy, especially what might one conceive of an ethics of design. There is a more direct influence and lineage, in projects such as the White City in Tel Aviv and the Institute of Design in Chicago. One of the strengths of the Guardian feature is that it points to some legacies that do not seem immediately obvious. For example, both Michael Craig-Martin and Jonathan Barnbrook claim that the true heir of Bauhaus is Ikea, with the justification that the Swedish brand offers, as Barnbrook remarks, ‘furniture made with simple production methods that is accessible to all, affordable and has a simple, clean aesthetic.’ That said, Ikea’s philosophy is born out of the need to compete in the marketplace rather than utopian ideas, and in that instance as David Barringer for Design Observer pithily puts it ‘form does not follow function, it follows price.’ Moreover, given the ecological imperatives that we currently face, surely a contemporary Bauhaus would balk at the cheap, disposable products that Ikea offers its customers? Owen Hatherley writing for Dezeen makes an interesting comparison, in terms of legacy, between Bauhaus and the London Underground. 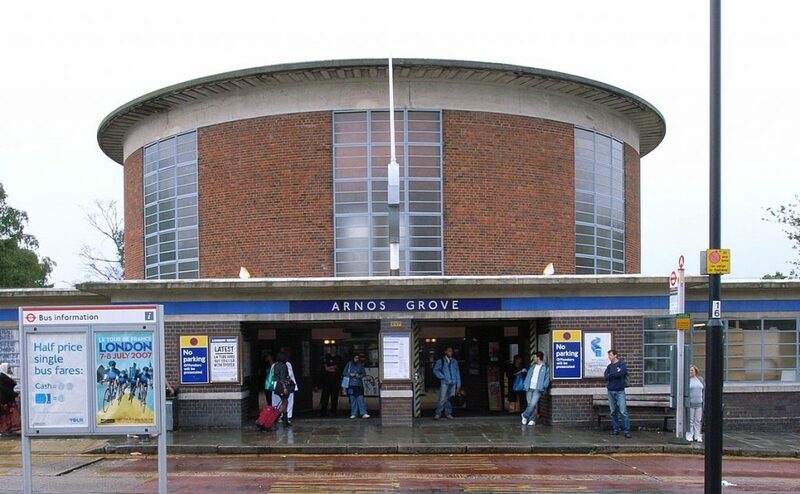 Hatherley notes that Frank Pick, who oversaw the design strategy of London Transport in the 1920s, and was considered something of a progressive, did not have a favorable view of the Bauhaus. Despite this, Hatherley writes that ‘through the tube stations and posters and typefaces he commissioned, he made London Transport into the nearest thing Britain had to the Bauhaus, a total modernist artwork.’ Moreover, public transport in general has links to progressive politics — just compare the New York underground with those in Europe to see what happens when progressive ideas are not applied. So there is something inherently Bauhaus-like in the connections between the social good of public transport and a modernist grand project. My own thought is to take an organisation not commonly associated with the Bauhaus: Comme des Garçons. The Bauhaus has influenced designers at Comme des Garçons such as the companies’ founder and chief designer Rei Kawakubo, especially through the ideas of László Moholy-Nagy. Junya Watanabe‘s SS15 women’s wear collection betrays the influence of the Bauhaus’s use of primary colours and geometry. Moreover, Comme des Garçons’s avant-garde philosophy, attention to materials and construction share similarities with the Bauhaus in ethos if not aesthetic. 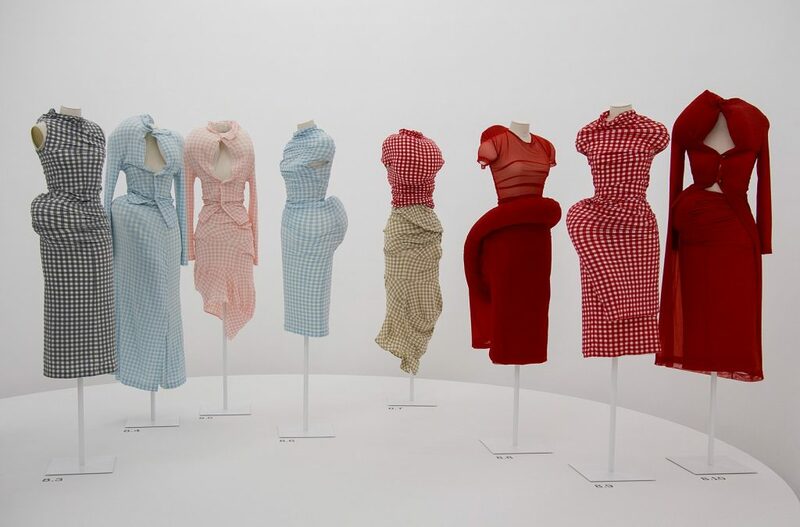 What I believe also makes Comme des Garçons an appropriate comparison is the fact that it has provided an education for several notable designers. achieving mastery over their craft through years of working on garments first hand — not just sketching — something which is increasingly rare and valuable today. But there is also a special sort of a apprentice-master relationship between junior and senior employees at the Comme des Garçons company, at which young designers learn invaluable know-how. This apprentice-master relationship echoes that of the Bauhaus-style guild system, as does the focus on working with the material rather than being preoccupied with the early stages of design by focusing on sketching. Ikea might provide a final product that resembles the Bauhaus, London Underground might follow its social and aesthetic goals, and Commes des Garçons epitomise its avant-garde educational ethos, and all of this just underscores how unique the Bauhaus was and, arguably, still is. What made it so unique was the amalgamation of all these traits. But while its legacy might live on in spirit, I can’t help wish that it also did in bricks and mortar. * I owe this breakdown to the excellent article by Nikil Saval, “How Bauhaus Redefined What Design Could Do for Society” in The New York Times. Header image: Das Bauhaus in Dessau; aufgenommen im Juli 2011 während einer Radtour von Magdeburg nach Prag, courtesy Hjochheim.